I love my wood cutting boards and recently added a butcher block island to our kitchen. 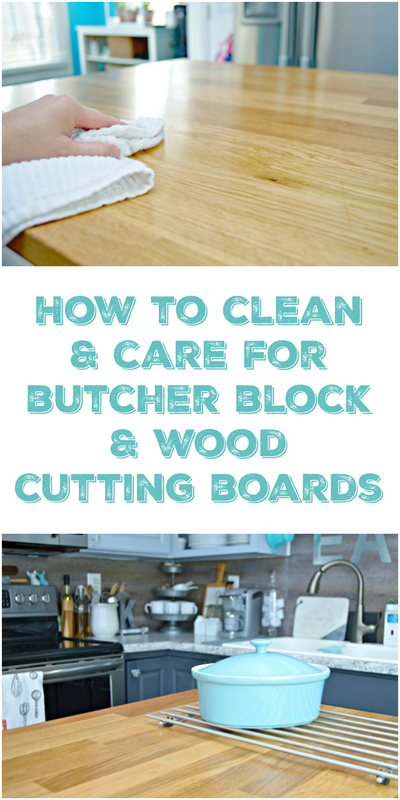 Wood can warp, stain and be scratched pretty easily, so today I’m sharing How To Care For and Clean Wood Cutting Boards and Butcher Block. Cut a lemon in half and dip it cut side down in kosher salt. 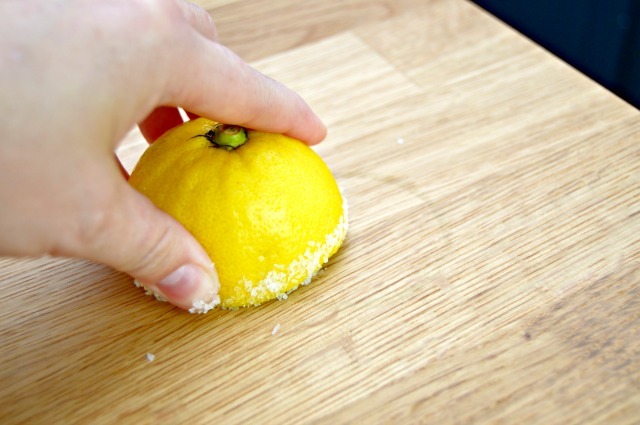 Scrub the stain with the cuts side of the lemon and kosher salt, going with the grain of the wood. 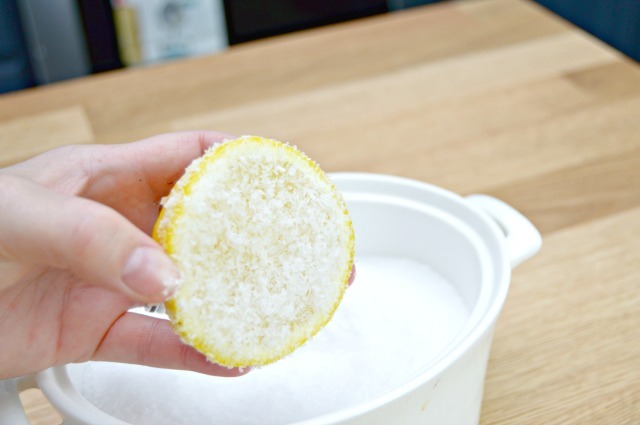 Once the stain is completely removed, wipe the salt and lemon juice away using a clean cloth. 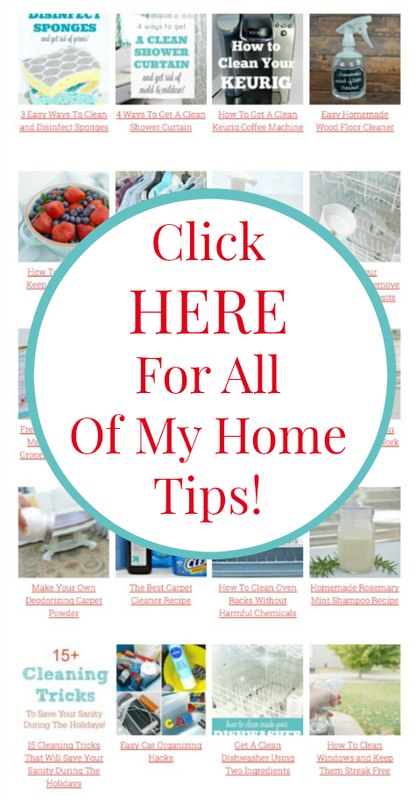 Take a damp cloth and remove any left over residue. 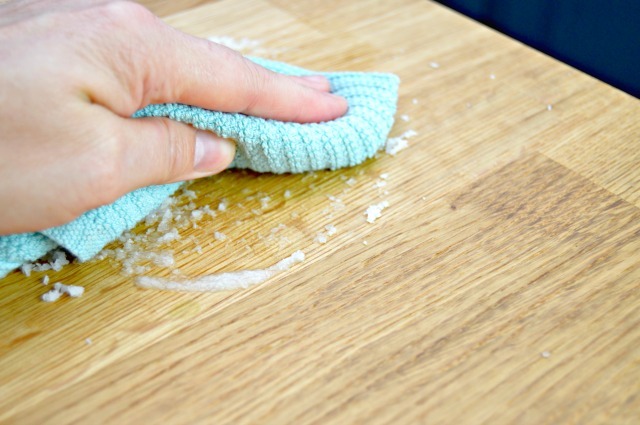 Use this method to clean any messes on your cutting boards or butcher block without harming the wood. 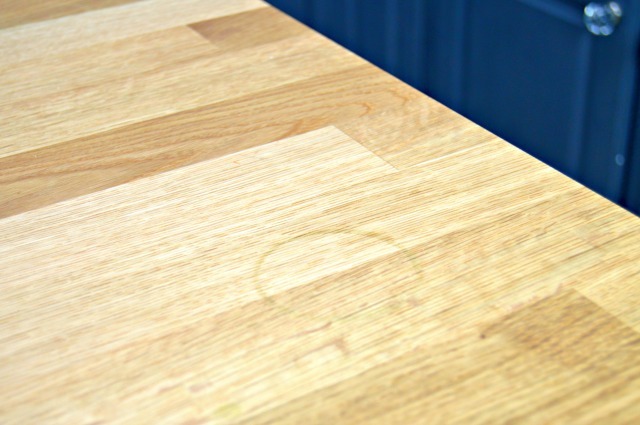 TIP: Never soak your cutting board in water…it will warp the wood and ruin it for future use. You can use a damp cloth to wipe your cutting boards off, but make sure to dry them quickly. Now, onto the care of your wood cutting boards and butcher block! 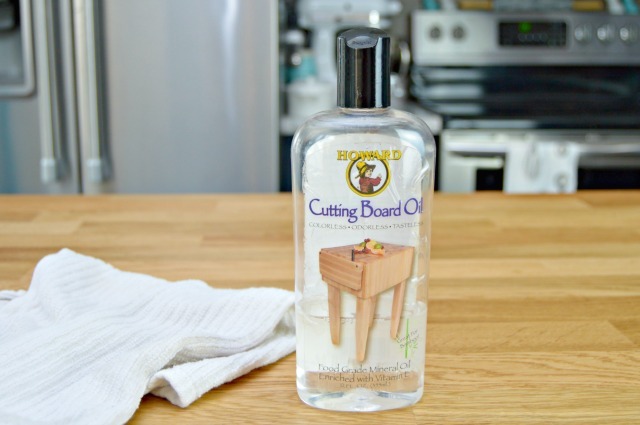 Mineral oil is the best thing to help prolong the longevity of your wood cutting boards and butcher block counter tops. It helps to moisturize and seal your butcher blocks so they won’t dry, crack and soak in food stains. You simply spread a thin layer onto your wood surface and allow it to sit for 20 minutes. After 20 minutes, wipe clean with a dry cloth. I typically treat my butcher block surface every couple of weeks and my wood cutting boards when they start to look a bit dry. It’s also important to take good care of your wood cutting surfaces in other ways. 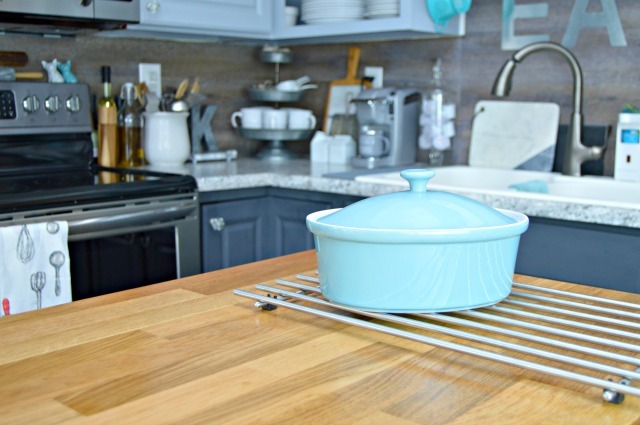 Never place a hot pot or pan on the wood surface…use a trivet or metal rack instead. Do not sit glasses full of liquid on the wood surfaces since the liquid can warp the wood…use a coaster instead. 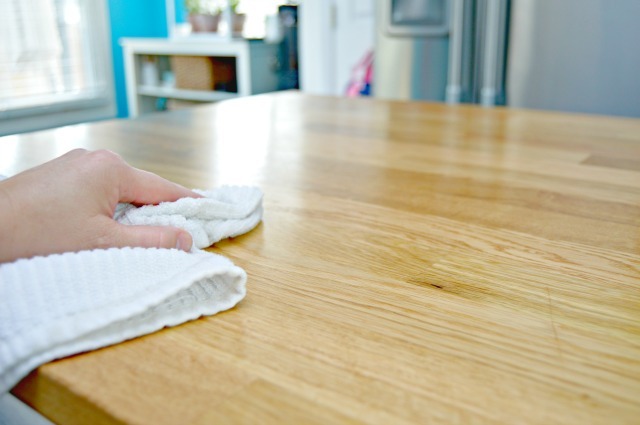 If you have a scratch or stain that will not come clean using a lemon and salt, try sanding it lightly using a fine grit sandpaper, then polish with mineral oil.